Arthur James Farnworth was born on 30 September, 1923, in Geelong, Victoria, Australia. He was named Arthur James after his father, Arthur, and paternal grandfather, James – both born in Bolton, Lancashire, near the village of Farnworth in the United Kingdom. Grandfather James Farnworth was a Federal Woollen Mill employee and, at the time of his death in Geelong in 1946, was the only Life Member of the Textile Workers’ Union, of which he was Federal and State President for several years. Arthur was educated at North Geelong Primary School, and Geelong Junior Technical College, where he excelled in his studies. In his youth, he played competition tennis, and acquired skill as a distinctly non-classical pianist, which served him well over the years, not only as a way of relaxing but also as a means of entertaining friends and party-goers. Although expected to enter a trade like his father, Arthur’s successes as a student led to more academic pursuits at the Gordon Institute of Technology, Geelong, from which he graduated as an Associate in the School of Industrial Chemistry in February, 1943. He then gained his BSc at the University of Melbourne in March, 1945, and an MSc in organic chemistry in April, 1946. The friendships forged during Arthur’s final year at the Melbourne University Chemistry School lasted a lifetime. That particular group – ‘the Chem IV mob’ – continued to meet on an annual basis for the next 60 years, including their mutually agreed final dinner at University House, which Arthur attended five days before his sudden death, in 2006. Immediately after the Second World War, Arthur travelled by ship to England on an ICI scholarship to work for six months at ICI’s dye division in Manchester, then undertook doctoral studies in textile chemistry at the University of Leeds under the supervision of Prof John B Speakman. Arthur gained his PhD, awarded in July 1948, for studies on ‘The Reactivity of the Keratin Molecule’. He was joined in England by Enid Brown, a bacteriology student he first met while at Melbourne University, and they married in the Methodist church at Chorley Old Road, Bolton – the church where his paternal grandparents had wed – on 16 October, 1946. Their stay in England happily overlapped with the Ashes tour by Don Bradman’s ‘Invincibles’, whose (now legendary) achievements Arthur relished. Arthur and Enid returned from England in 1948 on the same ship – RMS Orontes – as the cricketers, and befriended Keith Miller through their shared musical interests. Arthur and Enid settled in Geelong in late 1948 and had three children. They celebrated their 60th wedding anniversary two months before his death. 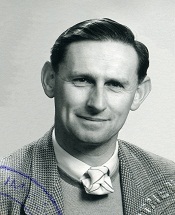 Arthur lectured at the Gordon Institute for six years, mentored by WR (Roy) Lang until, in 1955, he secured a Research Officer position at the newly established CSIRO Wool Textile Research Laboratory, Development Processing Unit, in Belmont, Geelong, headed by Menzie (Pip) Lipson. The Unit became the CSIRO Division of Textile Industry in 1958. Arthur’s focus at CSIRO was to find a way for manufacturers to create permanent creases in woollen fabric. The Australian wool industry was at that time suffering through competition from cotton and the newly developed synthetic materials that allowed clothing to hold its shape better than woollen garments, especially after washing. The process he invented – named SiroSet – was welcomed by the international wool industry, and has stood the test of time. In 1959, Arthur was rewarded with a Queen’s Honour (MBE) for his outstanding contribution to the wool industry. SiroSet was patented at the time, is a registered trademark in Australia, and has repeatedly been acknowledged in lists of significant Australian inventions. The invention is recognised through a street named Siroset Close in Dunlop, ACT, and its definition appears in the Collins, Macquarie and on-line dictionaries. In 2006, the SiroSet process was recognised (No 6 of 14) in a series of Australia Post maxi cards celebrating ‘Australia’s science, Australia’s future – CSIRO’s 80th anniversary’. Arthur’s work required travel to the UK, USA, New Zealand, South Africa, and most other wool-producing countries. Consequently, he travelled widely, beginning with Burma in 1957, and including communist China in the early 1960s (for which he had to obtain ASIO security clearance). During 1959-60, he worked for five months at the Swedish Institute for Textile Research (Svenska Textilforskningsinstitutet) in Gothenburg. Like many other young men of his time, Arthur was committed to community service. His substantial contributions – including Community Chest Director 1955-64, fundraising campaign (co-)Chairman 1954-55-57; Apex member 1952-64, editor of The Apexian national newsletter during mid-1950s – were recognised with life memberships of both the Geelong Apex Club and the Geelong and District Community Chest Association. Arthur’s life experience spanned from tradespeople to fashion gurus, and he had the capacity to engage most people, whatever their background or station in life. The tributes from colleagues when he retired indicated a style of leadership by example, characterised by hard work, wise counsel and strong administration, tempered by informality, and the ability to get to know and appreciate the hundreds of staff as individuals – he new most of them by name. He was gifted in both written and spoken communication, and effective use of humour, which was sometimes decidedly ‘blue’. Arthur’s retirement from the wool industry in 1988 allowed him to spend more time at Mallacoota, tour Australia, and pursue an active life as a field naturalist and keen photographer of Victorian flora and fauna. He took to this new endeavour with the same discipline and scientist’s curiosity as other ‘jobs’, joined the Entomology Society of Australia, and both Ringwood and Victorian Field Naturalists Clubs. He served as (Vice-) President of the Field Naturalists Club of Victoria from 1988 into the early 1990s. An occasional contributor of stories and photographs to Australian Geographic magazine, he eventually donated his photograph collection to the Museum of Victoria, and some of them were published in a field guide entitled Melbourne’s Wildlife: A Field Guide to the Fauna of Greater Melbourne (CSIRO Publishing, 2006, Paperback – ISBN: 9780643092549). Arthur was a generous provider, not only for family, but also friends and numerous charities. As Enid’s health deteriorated (Alzheimer’s), Arthur undertook to care for her at home for several years rather than commit her to nursing home care. When the inevitable crisis occurred and she moved into a nursing home, he visited her every day. Arthur suffered a major stroke in 2004 and, after lengthy rehabilitation, joined Enid in a shared room at the Manningham Centre, Doncaster. Remarkably, Arthur passed away on Enid’s 82nd birthday on 10 December, 2006, and she followed on 3 April, 2010. Arthur received several honours and awards for his invention of SiroSet and his contributions to the wool industry. Farnworth M, Farnworth P, Farnworth L, 2010, Personal communications (and extracts from obituary delivered 14 December 2006).